Dr. Horn returns to Washington, DC to expose a harrowing plot by Deep State Alister Crowley and Masonic devotees that hold an almost unbelievable secret they do not want you to understand: American society is being manipulated through a Washington-based Shadow Government in quest of that Final World Order prophesied in the books of Daniel, Revelation, and on the Great Seal of the United States! 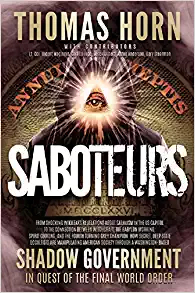 This investigation addresses: 1) The supernatural truth behind the Trump Derangement Syndrome 2) How the federal bureaucracy is a tool of Deep State Occultists *Shocking revelations about Satanism in the US Capitol from WikiLeaks. Former DNC Chairwoman Donna Brazile who admits the Clinton Campaign did indeed display all the signatures of A CULT.